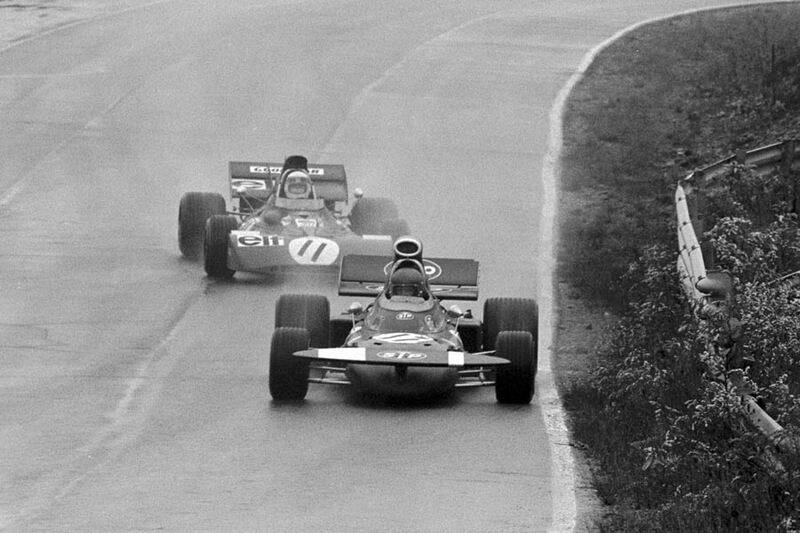 Newly crowned world champion Jackie Stewart took a sixth win of the season by winning the Canadian Grand Prix at Mosport Park, despite the dreadful weather conditions. After a fatal accident in the supporting Formula Ford race, the Grand Prix was delayed and the rain was heavy as the cars took to the grid. Stewart led away with Ronnie Peterson's March slotting in behind him and Jean-Pierre Beltoise in third place as the cars splashed around the opening lap. Mark Donohue (McLaren) ran fourth ahead of the Lotus of Emerson Fittipaldi and the second Tyrrell of Francois Cevert but Graham Hill was an early casualty when he crashed his Brabham and Clay Regazzoni shunted his Ferrari and he was lucky to emerge from his blazing car unscathed. As Stewart built his lead, Peterson had his hands full with Beltoise who harried the Swede until the Frenchman crashed his BRM on lap 16. Donohue pitted for a new pair of goggles but was fortunate to keep his place and remained third behind Peterson. He continued to push Stewart hard and took the lead on lap 18 and was able to fend off the Tyrrell until they came up to lap traffic on lap 31. Showing masterful race craft, Stewart took advantage of a moment of hesitation from Peterson and leapt into the lead and Peterson damaged his car seconds later when he hit the back of the BRM of Canadian driver George Eaton. It affected the balance of Peterson's March and he was unable to mount another challenge, instead having settling for second place. Stewart hung on to his lead to win to underline his world champion status while Peterson and Donohue joined him on the podium.